From a young age, David Dumbrell has had a fascination for all things mechanical: how they worked and how they moved. They always caught his eye and held his attention. Using gears, cams, levers and pulleys which David designs and fashions himself, he tries to capture the grace and fluidity of human movement. The concepts and execution of the pieces are his own, with the help of his wife Maryke who gives the pieces their personalities by painting and deciding upon the fabrics and colours. 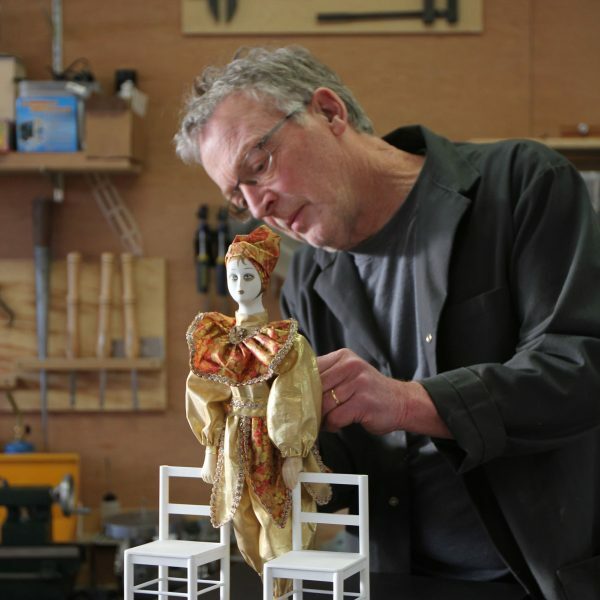 David also enjoys repurposing second-hand dolls, doll parts and doll clothing, giving them new life in unexpected ways. David Dumbrell lives and works in Vancouver, BC, Canada. He is a member of the Sculptors Society of BC and is an associate sculptor of Sculpture Northwest. I am primarily inspired by the automata masters of old – the famed eighteenth century Swiss watchmakers Pierre Jaquet Droz and Henri Maillardet. While I cannot hope to ever match their mastery, I like to challenge myself with increasingly more complex work. To this end I moved from wood mechanics to metal, and subsequently introduced motorized movement. I design and machine all wood and metal parts, and I am even teaching myself to sew. In addition to designing and creating my own human and animal figures, I also try to repurpose dolls and clothing where I can – I love the moment of inspiration when I find the perfect facial expression on a doll at the thrift store or garage sale!